Big brands continue to be overtaken by lean, emerging start-ups. Consider how the entire paid television and Blockbuster sector has been overhauled by streaming services like Netflix and Hulu. If brands are not agile and quick to adapt, they can become irrelevant. Fast. One way in which brands are successfully reinventing themselves is by looking within their business and establishing themselves as the go-to authority within their industry. To do this, they become knowledge centres. Not only does this create a new, unique selling proposition, but they also succeed in finding a way to continue to offer value to customers. If people type a keyword used in your industry into Google, they should be met with a lot of content from your brand. Everything from helpful information to the top 10 guides to online tutorials should be published by your brand. This content needs to be optimised for keywords to deliver results. A brand becomes authoritative if they have a strong brand narrative. Creative storytelling across multiple platforms can help you develop authority. To build trust, you need to engage with your customers emotionally. One way to do this is to tell your brand’s story and get your online community contributing to your brand in the form of user-generated content. The most successful brands are the ones who are transparent and encourage collaboration from their audience. Instead of trying to control your brand, invite your audience to engage with you so that they can help you build your brand. 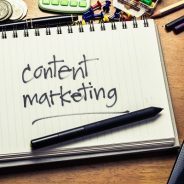 Are you ready to use content marketing to transform your company into a knowledge centre? Then contact WSI OMS today.